Television, from 40 providers worldwide, is coming to the Xbox 360 this holiday. It will be showing up in many different ways. Here's a look at Comcast's version. 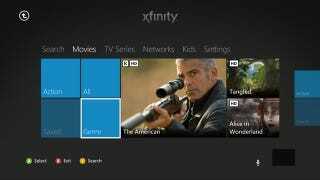 Where Verizon FIOS subscribers will get a sort of light version of IPTV, Comcast subscribers will get an Xbox 360 version of the Xfinity TV app already out on the iPad, iPhone and PC.